The Wynn Audio room in Thornhill West, once again, was truly exceptional, easily ranking as one of the Best Rooms at the show. Stepping through the door it was immediately apparent that this was a very formal presentation of some of the very finest gear the industry offers. Yet it was inviting by virtue of it being a non-scripted presentation, open to requests from those who brought their own music. There were also knowledgeable people like Le Nigen Guillaume and KC Wong to answer your questions. Not many people can afford gear in this league, but the door was open to all and it was an opportunity for audiophiles of all means to experience music at a very exalted level. The size of the room was appropriate for the scale of the system and the combination of the two commanded the respect and silence that allowed for a pleasurable listening experience. 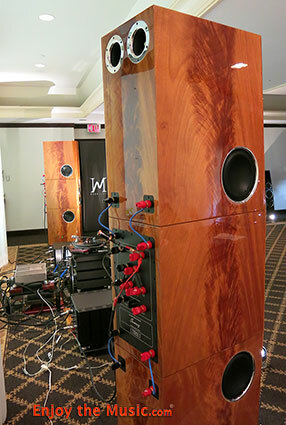 I walked around and admired the bookmatch veneers on all sides of the Tidal Audio Sunray loudspeakers ($180,000), the side-firing woofers on the top and bottom modules and the metal grille screens on the front-facing drivers in the center module. While these 700 pound speakers were driven by the Tidal Assoluta Monoblocks ($200,000 per pair, and many hundreds of watts each), they are said to be very efficient and tube friendly. I didn't hear any clipping and while the brass had bite, it wasn't any more painful than live trumpets, and certainly not irritating. The preamp was a three box phono and line stage Tidal Presencio ($92,000) with inputs for up to three tonearms. 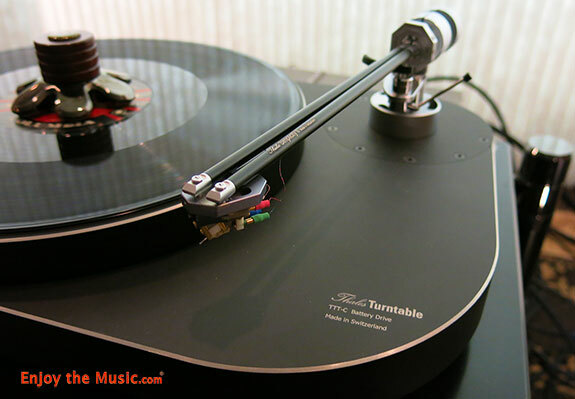 There was only one tonearm on the Thales TTT-Compact turntable ($17,000, from Switzerland) � the Thales Simplicity II tonearm ($12,500), a unique twin-arm design that keeps the stylus perfectly aligned with the groove from start to finish on the LP. The cartridge was a very rare Lyra Olympos that looked like it had suffered flood damage. Only about 60 of these have been made as they require a vintage Parnassus cartridge as a donor for the platinum-iron magnets and 5N iron pole pieces used in the Olympos. It is a relatively modern design, first released in 2002, but using some older technology. It sounded really great to my ears and while I didn't know it at the time, it was a very special opportunity to hear it. The cost, today, would be well into five figures, I suspect, assuming you could come up with a donor. KC religiously waved the magic ionizer over each LP before it was played. That was a TU-812M Million Maestro record clamp on the Thales, which is unfortunately sold out, but a more affordable, if less exquisite, version is available from Combak (Reimyo). Ritual rules with analog. 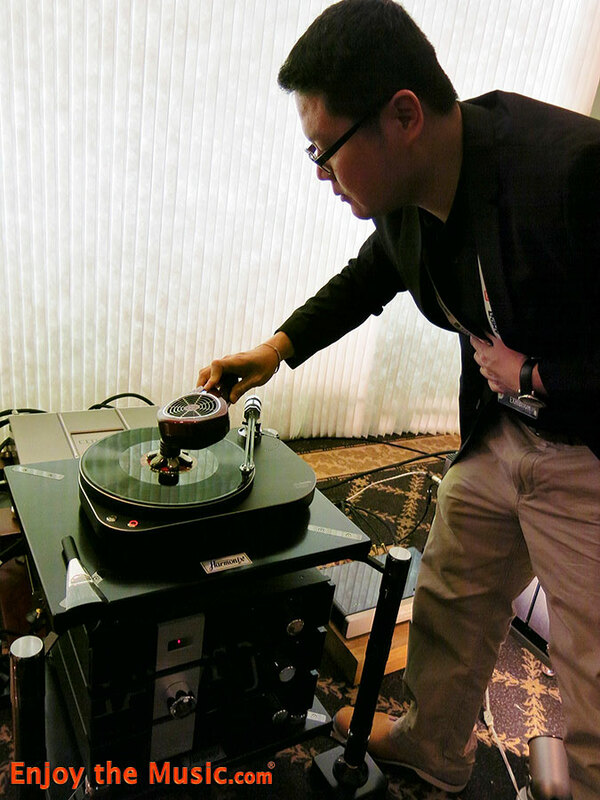 Digital audio was handled by the renowned Reimyo CDT-777 CD transport ($12,500) and the Reimyo DAP-999EX Ltd DAC ($11,500). In case you're wondering, the digital gear was on a second stand, directly behind the turntable and preamp. One of the most interesting pieces I saw at the show was the Telos Grounding Noise Reducer ($5000). From a seminar I attended a couple of years ago I experienced the effects and importance of having an absolute ground for the system. The Telos unit takes grounding to a whole other level, using active technology to maintain an absolute zero voltage on the ground. The previous technology merely relied on the materials in the box to do that, and as additional components were connected to it, it would drift farther from the desired zero voltage, I'm told. I could see little green lights sparkling inside through the dark glass top of the Telos unit as the active circuitry continually monitored and adjusted for zero ground voltage. In this ultra-expensive rig they used one Telos for the power amps and another for source components and the preamp, but in a more modest rig a single unit would still make a significant contribution. 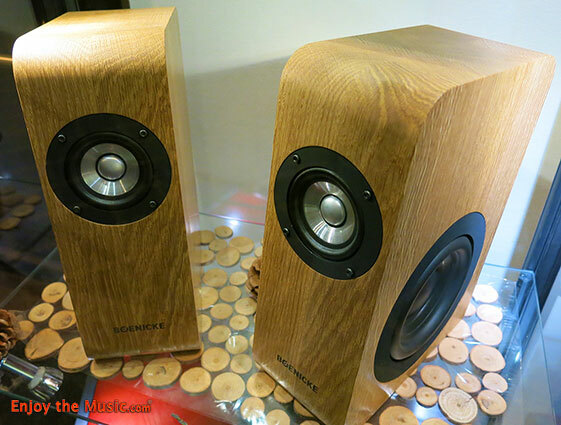 In a glass cabinet on silent display was a pair of Boenicke W5 monitors that were CNC machined out of solid oak and then face-glued to give the impression it is carved out of a solid butcher block of wood. Using a small forward facing near full-range driver with an aluminum cone and a side firing woofer, these speakers created quite a stir at the Munich show earlier this year and are in very high demand. No price, but coming from Switzerland, they will be expensive. Telos also makes some interesting looking Quantum Noise Resonators that were also on silent display in the cabinet. I had been given a "heads-up" about the Audio by Mark Jones room (next door, in Thornhill East) on several occasions. 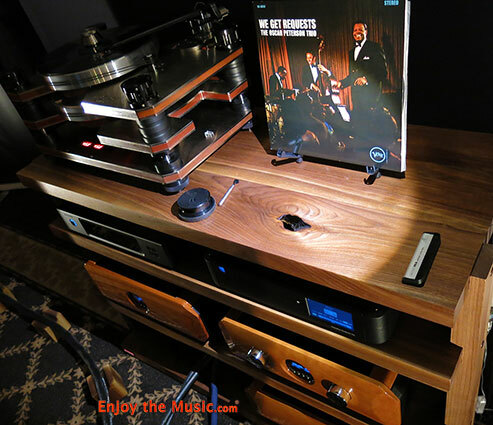 It was another stellar room at the show, featuring the new Magico S7 ($58,000 USD) driven by Tenor electronics with a Kronos Pro turntable as the analog front end and Aurender music server with PS Audio PerfectWave Directstream DAC ($6000 USD) doing the digital. 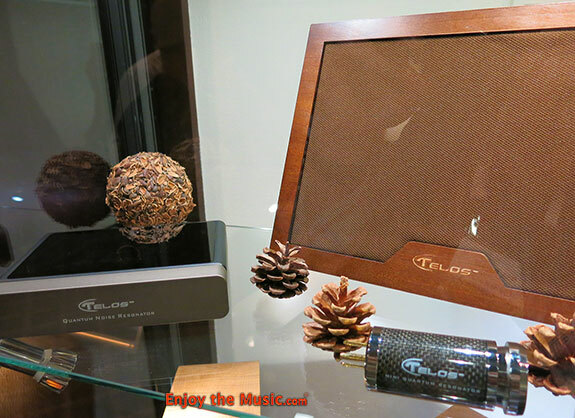 Tenor was showcasing their new phono stage ($50,000 CAD) which I heard at Montreal earlier this year, but in this smaller room they were featuring the stereo version of their 175S power amp ($55,000 CAD). 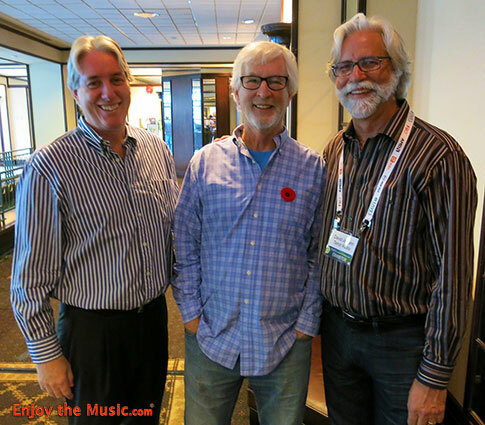 I had the pleasure of meeting the Three Tenors, Jim Fairhead, President, Tom Moynihan and David Johan, who took over the struggling company years ago, infused it with capital and raised the company to the current world class standard of excellence and financial stability. I also had the pleasure of meeting Mark Jones who was a lot more down to earth kind of guy than you might expect to meet selling gear of this caliber. It was interesting to hear how he evolved from being a more broad based retailer into becoming one of the most selective and expert dealers in the greater Toronto area � in Whitby, Ontario, just east of Toronto, to be specific. We chatted a bit about the Kronos Pro in the rig, and the Sparta 0.5 turntable on silent display which I was in the process of reviewing over the past few months. Dire Straits "On Every Street" was playing Fade to Black and sounding extraordinarily good at the time. This was an easy choice for one of the very Best Rooms at the show. I also took note of the fine Massif Audio rack with dramatic grain and knothole right in the top that lent authenticity to the structure and complemented the wood on the Tenor pieces, without trying to match them. 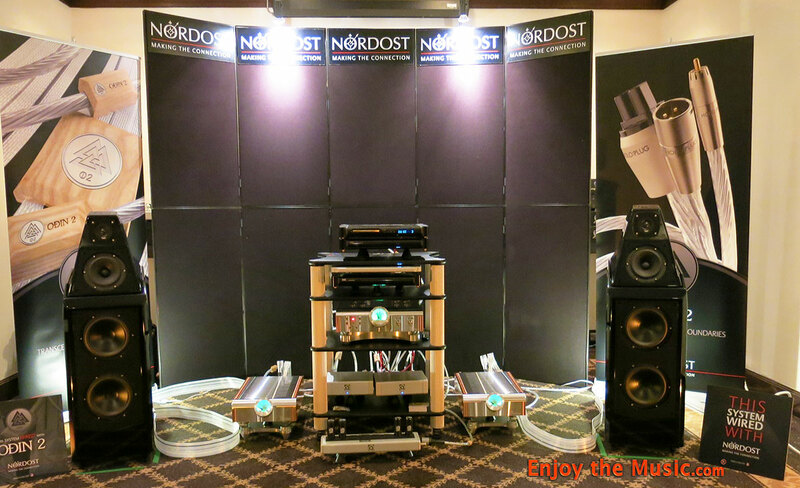 Making three spectacular rooms in a row was the smaller Victoria Square room hosted by Nordost. Is there an antidote for the misconception that these fine cables are made by Vikings in Scandinavia? Their roots are in NASA and space ships, not ancient sailing vessels! And they sure know how to cherry pick the industry to put together one of the very Best Booms at the show. The digital front end was a multi-chassis MSB affair propped up on Nordost Sort Kones, possibly surpassing the fine suspension already designed into MSB's top of the line DAC with separate chassis for digital and analog sections. With several flavors of Sort Kones to choose from, they obviously picked the one they liked best, and it seemed pretty good to me, too. Amplification was by Dan D'Agostino with his jewel-like preamp and monoblocks, which were also on Sort Kones. 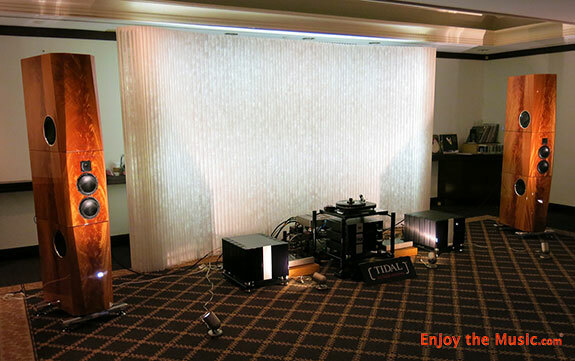 The speakers were the highly acclaimed Wilson Audio Sasha, which need no introduction. 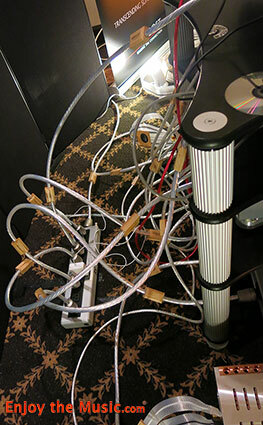 Everything was tied together with Nordost's Odin 2 Supreme Reference cables, seen here, perfectly aligned in rat's nest configuration. What better way to baffle the EMI and RFI? Well, perhaps the Nordost Qb8 primary earth AC power strip with a handful of Qk1 AC Enhancer modules plugged into it helped a little. Up in the rack, on the bottom shelf was a pair of QX power purifiers. I'll guess that one was used for the low level signal units and the other for the power amps. I see I have some more homework to do in this area. Next time around. But getting back to the Odin 2 cables, I learned the geometry of the interconnects changed and the gauge changed (from the original Odin) to take advantage of asymmetrical grounding where there are more conductors on the ground wire than the signal wire to lower the noise floor. With their power cord there are new connectors as well as a gauge change. Also the external TSC (ground) wire is connected to the connectors now, whereas with the old Furutech connectors, it was not. With the speaker cables they changed the number of conductors, the gauge and the connectors as well. The speaker cables also have a hollow air core which helps with the mechanical tuning of the cable. 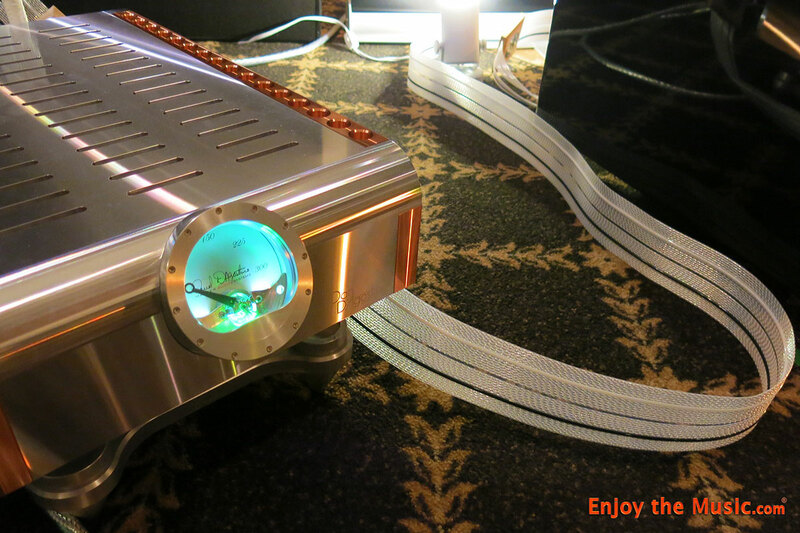 I asked Michael Taylor of Nordost about the seemingly excessive four-meter speaker cables and was told that they do this because they never know what length they will need in a given room at a show, plus the 4m length is said to sound better than the one-meter length. I would sooner test this for myself than lay down the long green for these expensive reference cables. It would be tough to argue with the results they achieved in this room, however.